If you have pet fish, you know how meticulous you have to be with their habitat. We have necessities that must be maintained to live a healthy life such as clean air, food and water. Seeing that fish live underwater, they are completely dependent on you to provide them with a comfortable environment. You’ll have to feed them and constantly monitor the pH balance and temperature lest you want to kill them. If you are a bit of a worry wart who is afraid you might forget to clean the tank enough or put in too much of a chemical, then the FishBit can help. This is a device and app combination that will let you control your aquarium from anywhere you have access to WiFi. 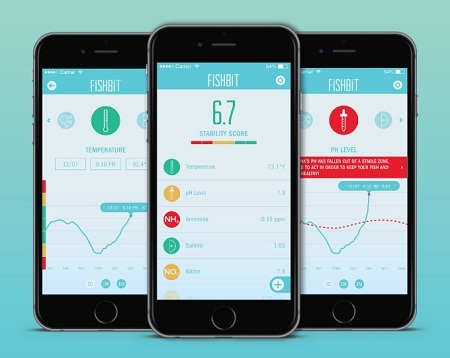 The outlet that you would plug your pump and lighting into will go directly into the FishBit controller, and the added device that goes into your aquarium will monitor the pH, salinity and temperature. Through the app, you can select triggers for your equipment that is plugged in and see the state of the tank from afar. This will certainly make caring for your tank easier. It will also ensure that your fishy friends are well cared for. Of course, that’s under the pretense that you’re willing to clean out their tank on time. While this is currently up for crowdfunding, they are not taking any more orders at this time. We’ll have to wait and see what comes of it when this hits the market.